Shuttler Parupalli Kashyap and boxer L Devendro Singh came up with stellar displays on Day 4 of competitions in the Olympic Games but India drew a blank and failed to add any medal to the bronze won by rifle shooter Gagan Narang. Kashyap lit up the morning by shocking his higher ranked rival Tien Minh Nguye of Vietnam, a quarterfinalist at the last world championship, in straight games to progress to the last 16 of men's singles. Kashyap, ranked 21st in the world, outplayed his rival who is ranked 11 places above him, 21-9, 21-14 in the second and final Group D match to clinch a berth in the knock-out stage by topping Group D, having beaten Tan Yuhan of Belgium in an earlier group match. Kashyap next runs into Sri Lanka's Niluka Karunaratne who shocked eighth seed Kenichi Tago of Japan. 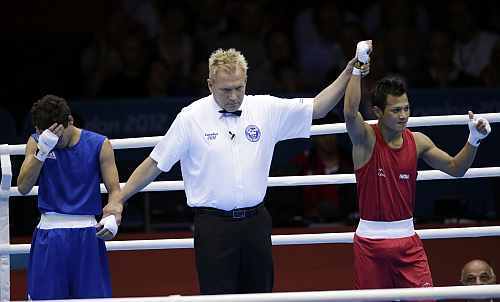 Manipuri lad Devendro, made a sensational debut in the Olympics, storming into the pre-quarterfinals of men's light fly weight category (49kg) in just two minutes and 64 seconds at the ExCel Arena. Devendro stopped his opponent Bayron Molina Figueroa of Hondurus with 36 seconds left in the opening round as the referee halted the unequal contest. The RSC verdict for Devendro helped him join teammates Vijender Singh and Jai Bhagwan in the pre-quarterfinals of the boxing competition. Indian challenge in the individual archery recurve section is almost over with all archers save Deepika Kumari have crashed out of their respective events. 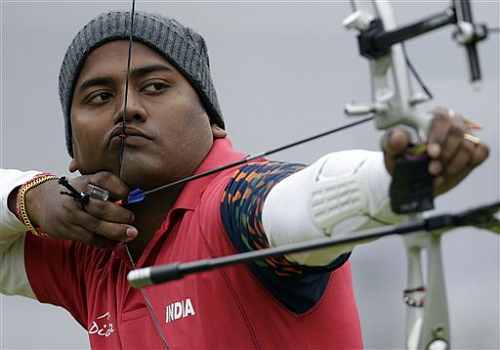 While Rahul Banerjee and Tarundeep Rai were eliminated in the second round of the men's recurve section, Jayanta Talukdar suffered a humiliating defeat in the opening round. In the women's section Chekrovulo Dwuro's erratic performance saw her bow out in a shoot-off. It will now be left to Deepika Kumari to at least give India's campaign in archery some semblance of respectability. While Tarundeep went down fighting against South Korea's world No 2 Kim Bubmin. The score was 6-2 in favour of the South Korean. This was after Tarundeep defeated JC Evans of Korea in a shoot-off after being tied 5-5. Rahul convincingly blanked Mongolia's Jantsan Gantugs 6-0 in the first round only to lose 3-7 to Rafael Dobrowlski of Poland in the second round. Earlier, in the morning, Talukdar was no match for his American rival Jacob Wukie, who easily pocketed the encounter 6-0, while Swuro went down fighting to Jennifer Nichols of USA 6-5 in the one arrow shoot-off after the scores were tied at 5-5. Indian women's doubles badminton pair of Jwala Gutta and Ashwini Ponnappa notched up a comfortable straight-game victory over Lei Yao and Shinta Mulia Sari of Singapore in their last group B match but still failed to enter the quarter-finals. The Commonwealth Games gold medallists saw off the world number 13 Singapore pair 21-16, 21-15 in a 34-minute match at the Wembley Arena. However, the Indian pair ended up in the number three position in the group based on the difference between points won and lost in all matches after tying with Chinese Taipei pair of Wen Hsing Cheng and Yu Chin Chien and Japanese combo of Mizuki Fujii and Reika Kakiiwa. The country's rowers also went out of medal reckoning and have to fight for minor places in men's single sculls and lightweight double sculls. 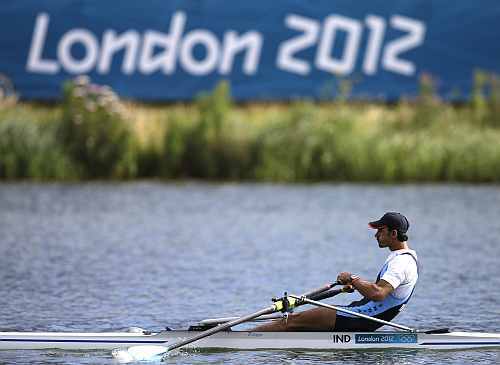 Swarn Singh Virk failed to qualify for the semi-finals of the single sculls as he came in fourth in the quarter-finals. Sandeep Kumar and Manjeet Singh finished sixth and last in the repechage 2 of the lightweight double sculls. 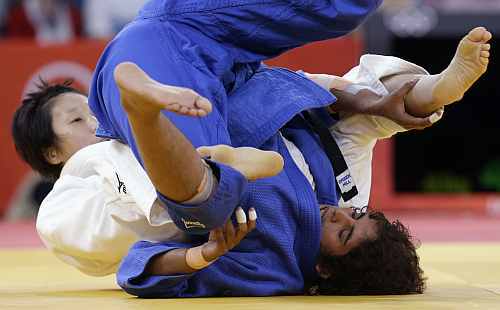 When the referee raised Yoshie Ueno's hand to declare her winner in the first round of the 63kg judo category, her opponent Garima Chaudhary unwittingly became part of a dubious Indian record she would like to forget in a hurry. The Meerut girl, who was floored in 81 seconds, is, thus far, the only Indian athlete who was in action for the shortest time in the 30th edition of the Games. It was always a tall-order for the World No 77 against a two-time World champion from Japan, but even Garima never expected that she would be floored even before a minute and a half of the contest was over. 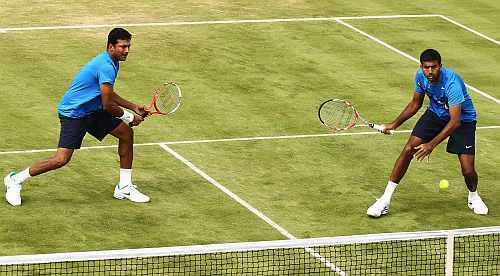 The Indian pair of Mahesh Bhupathi and Rohan Bopanna crashed out of the men's doubles at the London Olympics, losing 3-6, 4-6 to the French pair of Julien Benneteau and Richard Gasquet, on Tuesday. The Frenchmen needed just 77 minutes to demolish the fancied Indian pair, which had overcome Max Mirnyi and Alexander Bury of Belarus in a though three-setter on Monday evening. Meanwhile, the second round match between India's LeanderPaes-Vishnu Vardhan and the French pair of Jo-Wilfried Tsonga and Michael Llodra has been postponed to Wednesday.